The pressure mounted on the final day of the Extreme Sailing Series Cardiff, and it was more than apparent out on Cardiff Bay. Leigh McMillan helming The Wave, Muscat was in the hunt for his fourth straight win, to match the Alinghi record set in 2008, and things were generally going his way until the fourth race of today. A penalty at the start of that race for failing to keep clear of the boat to leeward put McMillan at the back of the nine-boat fleet. In a single moment, the door opened even wider for their stable-mates Oman Air, skippered by US sailor Morgan Larson, and Austria’s Red Bull Sailing Team to get back in the frame. Two races later Oman Air moved into the lead by just two points leaving McMillan and Hagara on equal points in second. It was the ever-improving Danish team SAP Extreme Sailing which enjoyed the glory of winning the final race, but the Oman Air crew had done enough. Finishing in second place cemented their spot at the top of the podium for the second time this season after winning the inaugural event this year in Muscat, Oman, and denying The Wave, Muscat their fourth straight win. “Our level of sailing was high enough to win all week, but somebody just always had a little better day than us, especially The Wave, Muscat,” said Morgan Larson. “You know, those guys are so good. They are a real challenge for us, but as it got lighter and shiftier, I think that worked to our advantage a little bit – it really was anybody’s race. We just got on a roll for the last few races. To win here is fantastic. It is a testament to the Series and the competitors that there were five teams in for the win on the last race." GAC Pindar, helmed by Andrew Walsh with US Laser Radial gold medallist Anna Tunnicliffe calling tactics, had sailed brilliantly throughout this event, putting the British team within touching distance of their first podium finish this season, but a penalty in the penultimate race ruined their chances and the team finished in fourth overall just three points behind Red Bull Sailing Team. 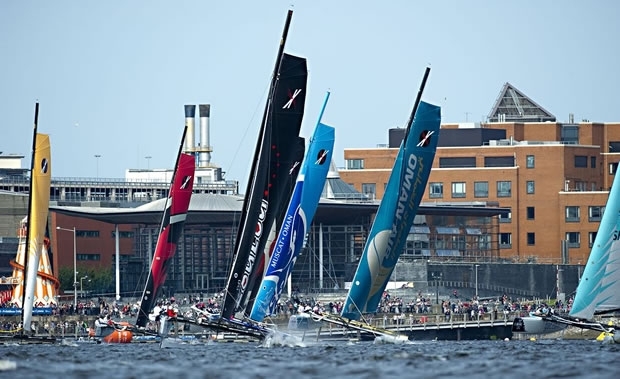 Groupe Edmond de Rothschild will leave Cardiff empty-handed and frustrated that their pre-season status as favourites is not bearing fruit on the water, although they retain fourth in the Overall 2012 rankings. Ernesto Bertarelli’s Alinghi team mixed it up enough to keep the leaderboard close going into the final day, finally finishing in seventh just three points off fifth placed SAP Extreme Sailing Team. Next stop on the Extreme Sailing Series will in Nice, France. OC Sport, the organisers of the Extreme Sailing Series, has been forced to cancel the event in Trapani, Sicily, due to start in just 10 days time as the Province of Trapani and the regional government of Sicily failed to execute their financial and operational obligations necessary to host the event.